This time last year I found myself waking up in Florence — strange for a Southern California resident — the chimes of the Duomo’s bells drifting through my open window. 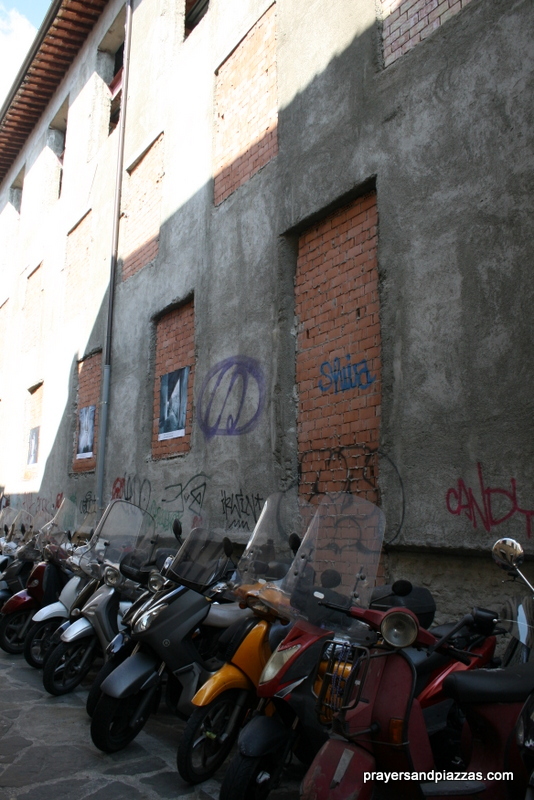 For me, every morning in Italy feels full of opportunity and ripe with undiscovered memories. But this particular morning promised a once-in-a-lifetime gift. 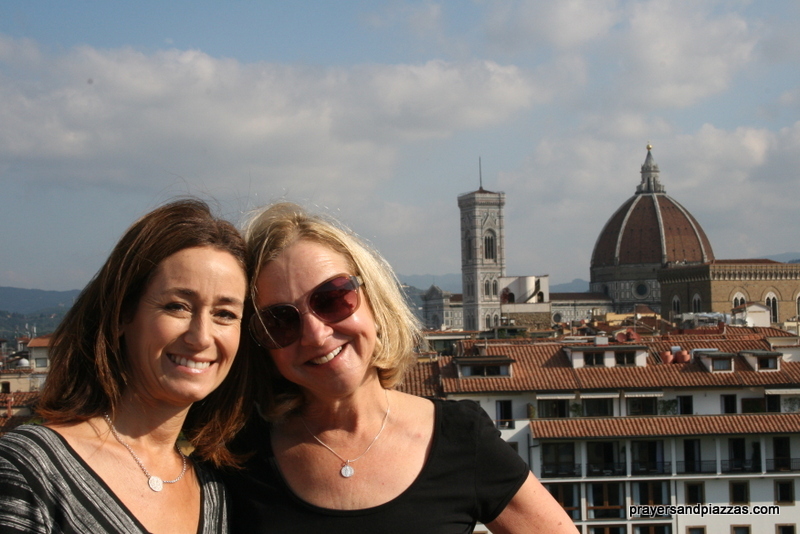 On a whim, I had run away to Florence to walk in the footsteps of Mona Lisa with Dianne Hales, the author who brought the iconic donna (woman) to life for me in the acclaimed book MONA LISA: A Life Discovered. On June 15, 1479, Lisa Gherardini was born in wool shop-turned-house on narrow Via Squazza (“wallow”) in the section of Florence known as the Oltrarno (beyond the River Arno). 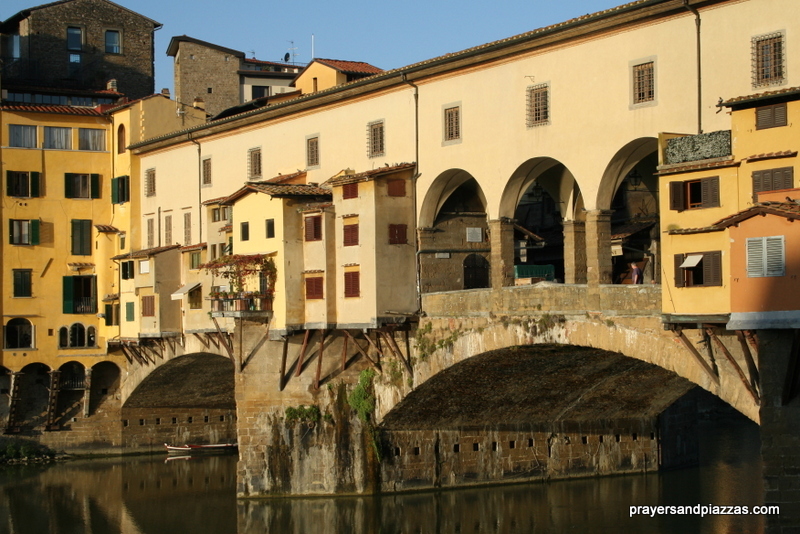 Still a lively and vibrant quarter, to get to there and to the starting point of the tour I crossed the beloved Ponte Vecchio, the only of Florence’s bridges to survive WWII. Traversing the bridge, I think about how Lisa herself must have crossed over these same cobbled tiles hundreds of times. “Graffiti smear the grimy houses that line the dank street. Trash huddles in corners. Wooden doors splinter and sag on rusty hinges. No one lingers in the gloom. No one seems to care about a girl named Lisa Gherardini born centuries ago amid the clattering mills of Florence’s cloth trade. Unexpectedly, I find that I do.” writes Dianne. Above: Via Squazza is shadowed, smelly, and eerily silent. We are the only people on the street, our little tour group. Lisa was born of a noble and ancient family, but their status had diminished by the time she was born. Next, we cross over (attraversiamo) the picturesque beauty below, Ponte Santa Trinita`, which was built in the late 1500s and reconstructed after WWII with stones recovered from the Arno. We arrive in the piazza of the church for which the bridge is named. Meandering through smaller and less crowded streets (strade meno affolate), we soon reach Piazza della Signoria, then and now, the civic center of Florence. Lisa’s much older husband, the cantankerous but successful silk merchant Francesco del Giocondo, served the Florentine government here in the early 1500s. 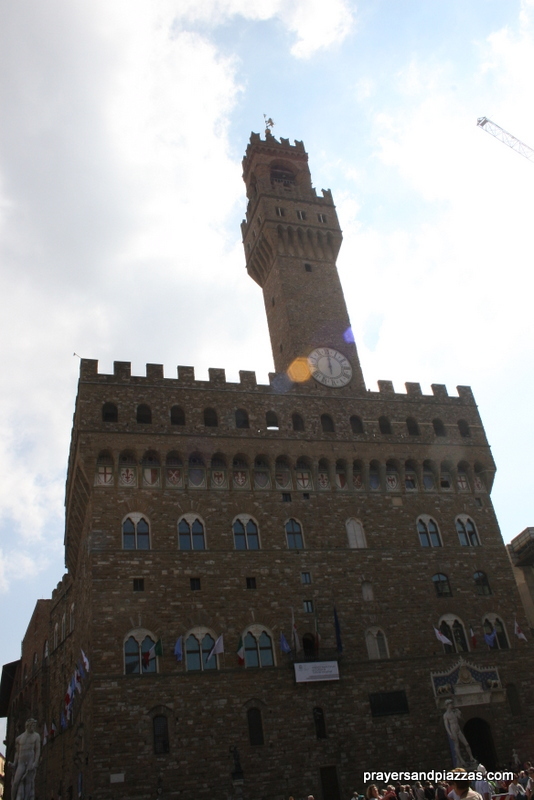 Above: This was my fourth visit to Florence but the first time that I stepped foot inside the Palazzo Vecchio. The first floor is free, although paying for an entrance ticket to the higher floors is extremely worth it. 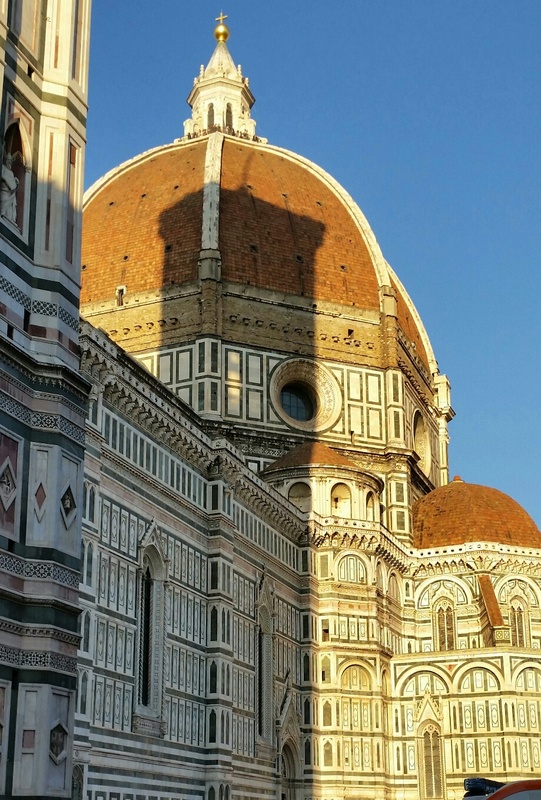 Likely the most famous and recognizable landmark of Florence, above is the cupola of Santa Maria del Fiore, but the Battistero di San Giovanni below is really more important to Florentines. “The Italian poet Dante and many other notable Renaissance figures, including members of the Medici family, were baptized in this baptistery.” Wikipedia “In fact, until the end of the nineteenth century, all Catholic Florentines were baptized here,” including Lisa Gherardini on June 15, 1479, the day of her birth. Far too soon for me, we find ourselves just a few blocks from Piazza del Duomo and on Via della Stufa, where Lisa lived out her married life in comfort and status, and raised her children. 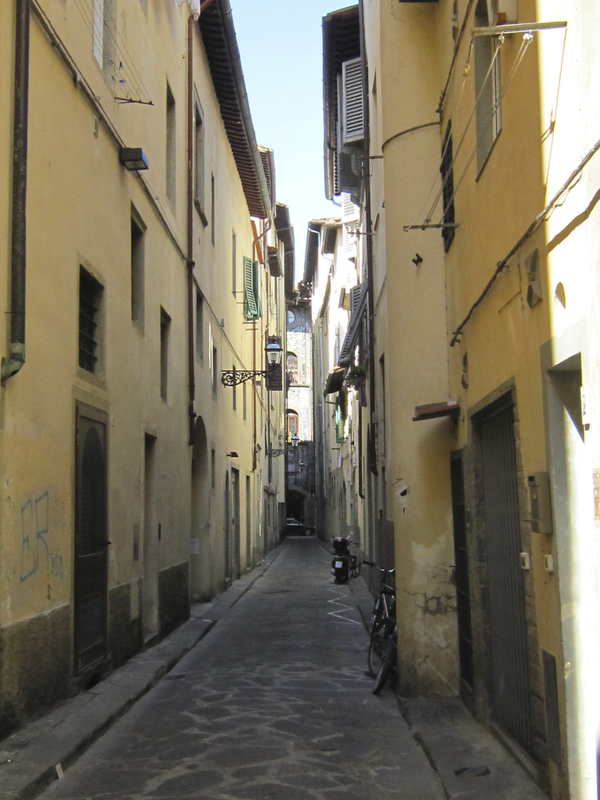 This pleasant street is almost literally in the backyard of Florence’s most renowned family, the Medicis. Above: Cappelle Medici (Medici Chapels) and the Palazzo Medici Riccardini (the Medici family home) cast their shadows on Via della Stufa. While touring this area the day before on my own, I had passed by Via della Stufa without even noticing. 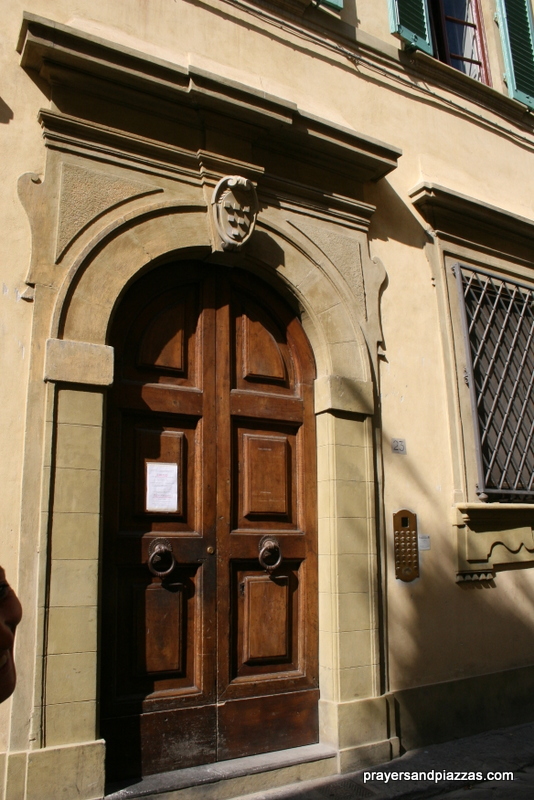 Below: Via della Stufa – of this door I am certain – restored since Lisa’s time but home of the Giocando family. Still today, this street is bright and inviting, but surprisingly quiet given its proximity to all things Medici. Perpendicular to Via della Stufa is Sant’Orsola, the ruined eyesore which was the convent where the widowed Lisa, lived out her last years. For me, this final stop was most touching of all. Once a prestigious convent in Florence, Sant’Orsola housed 60 nuns at a time and throughout the years, hundreds of young Florentine women training to take their vows, including Lisa’s daughter. Widows of status could also choose to live out there days within Sant’Orsola’s walls, which is what Lisa did. In a city glittering with Renaissance treasures, Sant’Orsola’s sheer ugliness is, in my opinion, unacceptable and heartbreaking. Still, the tour ends and my heart is full, from seeing a city I love through the eyes of the woman behind the most recognizable smile in all of history, with the author who captured Lisa’s humanity with eloquence. Stacy di Anna with Dianne Hales ❤ A great start to an unforgettable day. 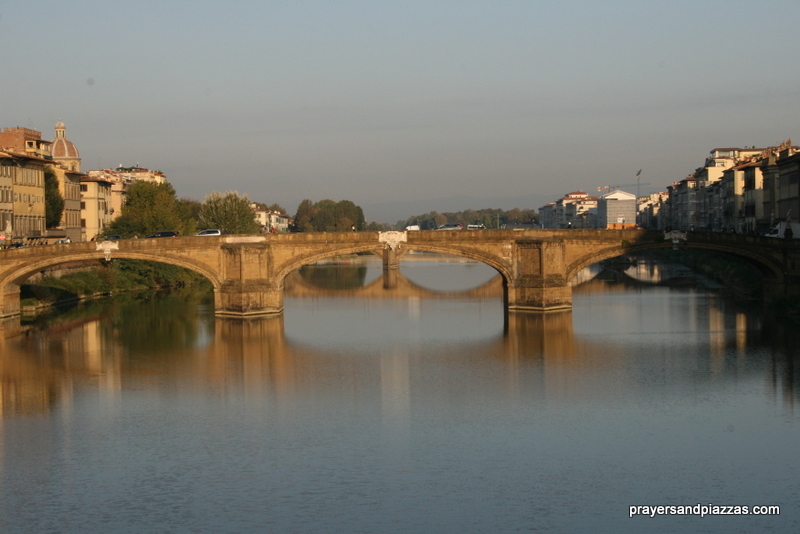 This unsponsored post first appeared on Prayers and Piazzas. For more on the Mona Lisa walking tours, click here. For more on Mona Lisa in Dianne’s words, click here and here. Tags: Florence, Italian history, Italy, Mona Lisa's Florence walking tour, Mona Lisa: A Life Discovered, Renaissance History. Bookmark the permalink. Previous post ← Which Way Now? Beautiful…Meghan and I feel in love with this city in 2008….. Thank you for reminding me to buy this book! Headed back to Florence next month. Grazie! I hope you have a fantastic trip! This is the perfect read to get you all ready for Florence! Buon leggere e buon viaggio!